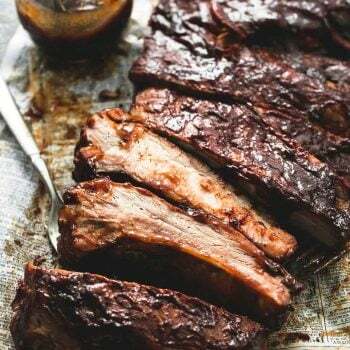 Learn how to make the BEST easy slow cooker bbq ribs. These incredibly flavorful and tasty baby back ribs are fall-off-the-bone tender. This is what Summer tastes like. Bbq ribs. When they’re good, really really good, I will take ribs any day of the year, no questions asked. But when it comes down to it I just think they taste better in the Summertime, probably because that’s when my mother always served ribs. If she was serving ribs it was likely Memorial Day, or my third oldest sister’s birthday, and overly warm and sunny outside. There was a good chance dessert would be homemade berry ice cream. It was always summer when we had ribs. And always grilled. She’d send Pops or one of my three brothers out back to the extra large grill on the cement patio with a pan of ribs and a bowl of what we called “secret sauce” which was really just a combination of ketchup and brown sugar that makes all things barbecued one hundred and fifteen percent more delicious. Funny story: the first time I ever tried to cook ribs, I put them on the grill, forgot about them, and bunt them to a crisp. Honestly there was nothing there but bone and char. And I almost cried thinking about the eighteen dollars I’d spent on a rack ribs and wondered how I’d ever tell my husband that instead of ribs we were having stovetop quesadillas for dinner. He didn’t mind of course because he’s him, but oh how I mourned the death of those baby back ribs that night. Lesson learned. I now put a timer on my phone – or three timers really, you know, just in case – when grilling anything, especially ribs. 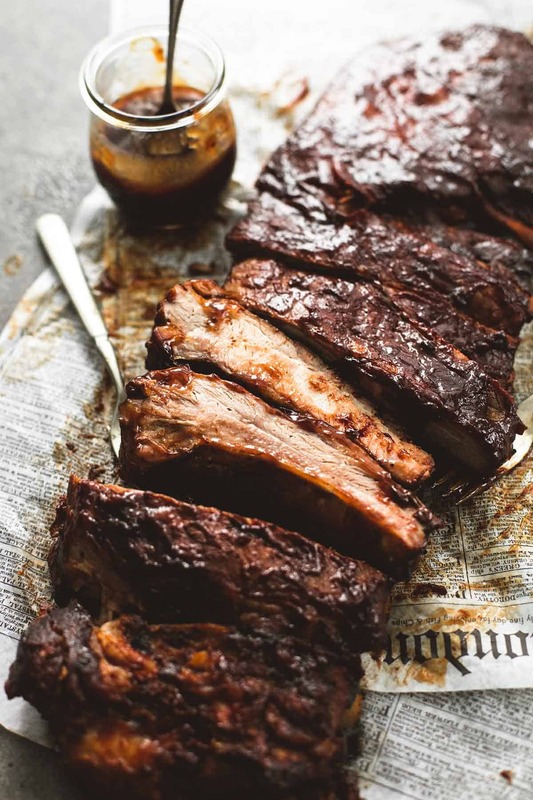 We are a few weeks shy of Summer weather around here, but Memorial Day will be here before we know it so I’m sharing with you a foolproof recipe for super tender and flavorful ribs that you cannot go wrong with. (Bonus: there is extremely little risk in burning these ribs to a crisp. Your ribs will not go uneaten.) These are slow cooker ribs. That’s right, ribs made in the crockpot my friends. 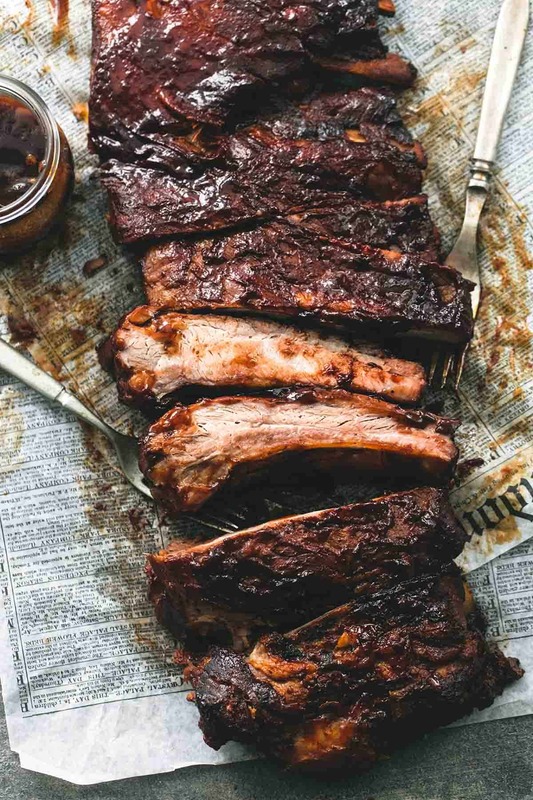 The key is to cook them low and slow for about 8 hours, then pop them into the oven for a quick broil – just 5-8 minutes or so – and you’ll have the ultimate, best ever slow cooker bbq ribs. 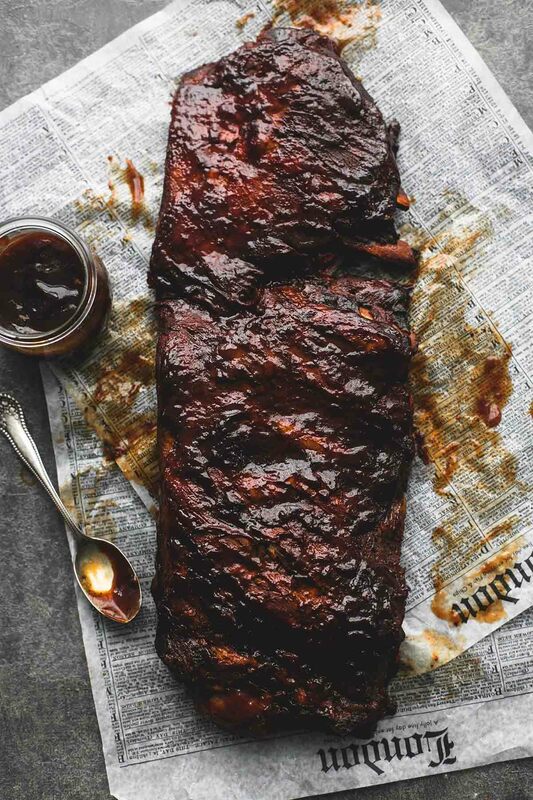 Don’t tell my mother I’m teaching you how to cook ribs any other way than on the grill, but these fall-off-the-bone beauties will become your go-to for every backyard bbq and Summer hangout. Grease your large slow cooker (6-8 quart) with nonstick spray. Stir together chili powder, cayenne pepper, garlic powder, salt, and pepper. Rub mixture all over the top side of the ribs. Brush about 2/3 of the bbq sauce over the ribs (reserve remaining bbq sauce), top and bottom. Place the ribs in the slow cooker so that they are standing up on one side and curl to fit into around the inner edge of the slow cooker. Cover and cook on low for 8 hours. Preheat your oven to high broil. Use tongs to transfer ribs to a greased baking sheet so that the ribs are laying flat. Transfer to the oven and cook for 5-8 minutes. (Set a timer for 5 minutes and check them to make sure they aren’t burning). Allow to cool just long enough so that the ribs can be handled and serve immediately. My favorite quick and easy way to add depth of flavor to bbq sauces is to combine two different varieties. 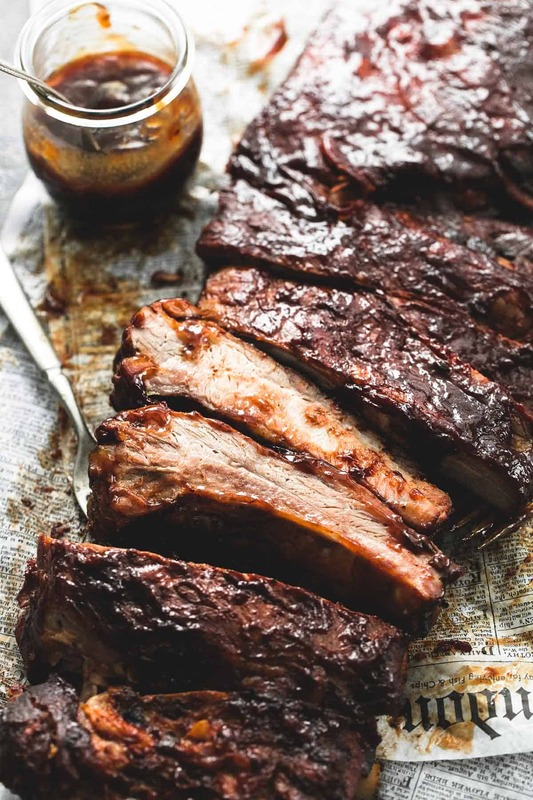 For these ribs, I like to do one cup of a sweet bbq sauce and one cup of a smoky or spicy bbq sauce – just stir together and use as directed in the recipe. hey girl- these ribs look so yummy! Going to try the Rack of PORK RIB this weekend. Hi there! I am confused about how the ribs are sitting in the crockpot while cooking. It sounded to me like you were describing them standing up vertically. However the photo looks like they are horizontal? The recipe sounds delicious! And I’m anxious to give it a try! Love the combination of flavours ! Vegetables aside and here we go: party to remember ! Thank you so much ! Looks phenom! Trying these tomorrow! Do you brush the remaining sauce when broiling, or just serve with the finished ribs? Thanks! I have the same question and mine are in the crockpot right now! Did you figure it out? I just stumbled onto your recipes. They look absolutely delicious. Because they also look so easy to prepare, I will definitely be trying to make these. These are seriously the BEST ribs I have ever had – better than any restaurant! My husband and I both loved them, and I will definitely be making them again! Thanks for the recipe! I don’t eat pork. Can this recipe work with beef ribs? Love the recipies. Have tried the shrimp n sausage, ver easy and delicious. The ribs looks so great! Thank you for sharing the recipe! Gonna try it tonight and have a great lunch tomorrow. I did not use any additional liquid. Just the sauce! Standing up one one side? How about an end? into? Neither makes much sense an editor is called for. Would it be possible for you to add a picture of the ribs in the pot while they are cooking? I think it would HELP us visual PEEPS to have a successful bbq. Great article! Looking forward to making this. Hi! I will look into making this possible- thanks for the idea! I am taking a short maternity break so I cannot get it done ASAP, sorry! 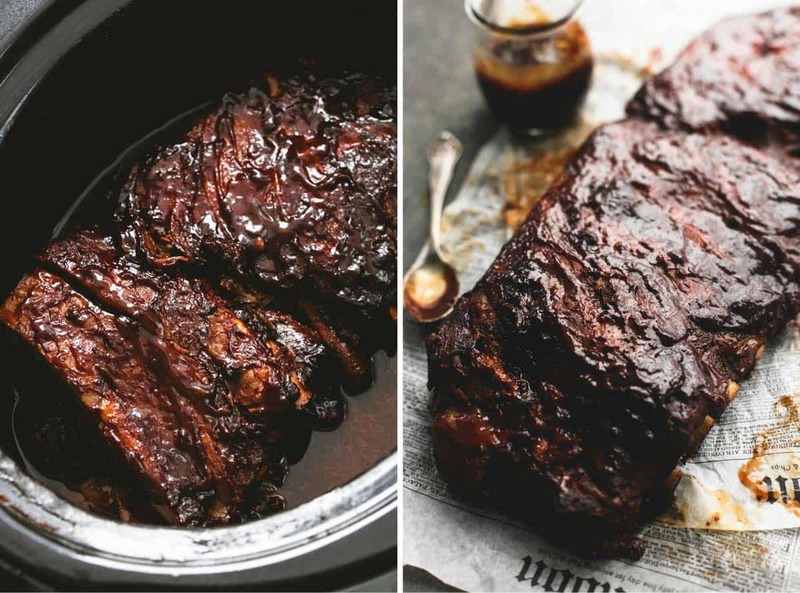 Just a question … I’ve seen different crockpot rib recipes that lay them flat to cook .. any reason why you stand them up? I find that they have a much better turnout if prepared this way! can you do four hours?? I definitely recommend using the longer cook time! But you could give it a try!